On 9 October 2017 Mr Tom Auwers, President of the Board of Directors, Belgian Federal Ministry of Public Health, Food Chain Safety and Environment, made his first visit to the WHO Regional Office for Europe in Copenhagen. He met Dr Zsuzsanna Jakab, WHO Regional Director for Europe, to gain further insight into WHO/Europe’s work and to discuss ways to enhance and strengthen its collaboration with Belgium. Ms Leen Meulenbergs, WHO Representative to the European Union, also joined the meeting. 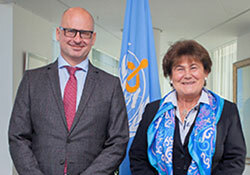 Mr Auwers and Dr Jakab discussed the ongoing WHO reform process, health system performance assessment, health workforce planning, immunization, the International Health Regulations (IHR) and emergency response. Belgium underwent a voluntary joint external evaluation as part of the revised IHR Monitoring and Evaluation Framework in June 2017. Belgium is also part of the 2017 national voluntary review of the High-level Political Forum on Sustainable Development, and the Belgian Government has committed to implementing the 2030 Agenda for Sustainable Development. This focuses on two main policy areas: sustainable, inclusive economic growth and a rights-based approach to development.